I took a sip of the champagne—the good, imported stuff. This was a celebration and I couldn’t have been prouder of my husband for getting the raise and soon, the title, he’d worked so hard for. Still, the thought tickled the back of my brain like the bubbles tickled the back of my throat: I need to level up in my career. The day job. It’s exactly what it sounds like. It’s the job that pays the bills while you’re working on the career, particularly a creative career. I’ve taken a lot of criticism over the years about how I balance the day job with creative endeavors, and it has mostly come from creative circles. From barely audible side comments and “just sayin’” observations, to dramatic tales of sacrifices made for art, I’ve lost count of the ways people tactlessly opined that I put far too much energy into the corporate resume and not enough into honing my craft. That these observations often coincided with something the observers wanted me to do for them is perhaps why I continued doing what I needed to do to live up to my own standards as a grown woman. The bills weren’t going to pay themselves, and it seemed better to work towards a job I could tolerate than to keep bouncing from something I hated to something I was about to hate in the interest of conserving energy for art (or using misery to fuel it). What I got for my effort was a resume full of day jobs that led to good jobs in my field, which I shaped into the corporate side of my career overall. On the corporate side, I have enough experience that I’m in demand but not so much that it works against me. I like what I do and I’m good at it. I even really like my current position, which I get to fulfill from my home office. Things are going well. The problem is the self-induced career stagnation. When an opportunity to advance the corporate side comes along, I think, If I throw my hat in the ring and it works out, then that’s what I will be—not a dark fiction writer. Though I am no more correct than the critics I’m able to ignore, when the thought is my own I tend to give it more attention than it’s worth, and that can lead to missed opportunities. This phenomenon is not unique to me; I’ve been discussing it with fellow creative people for a long time. In fact, many of the people who’ve criticized my balance of steady jobs with creative pursuits have also confessed to experiencing this same phenomenon, and I wonder if their criticism comes from not being 100% pleased with their own decisions (or indecision) on the matter. Yet, there I was, trying to make a crossroads out of a clear path, when my husband called to tell me he got his raise and to give me the details about pending promotions. Now, I don’t really believe in signs. It stands more to reason that we see the signs we want to see based on the decisions we’ve already made, but if I had been waiting for a sign that it was time to level up, that would have been it. No one can determine your path, assign your priorities, or define your success but you, and it’s perfectly fine to ignore anyone else who tries. 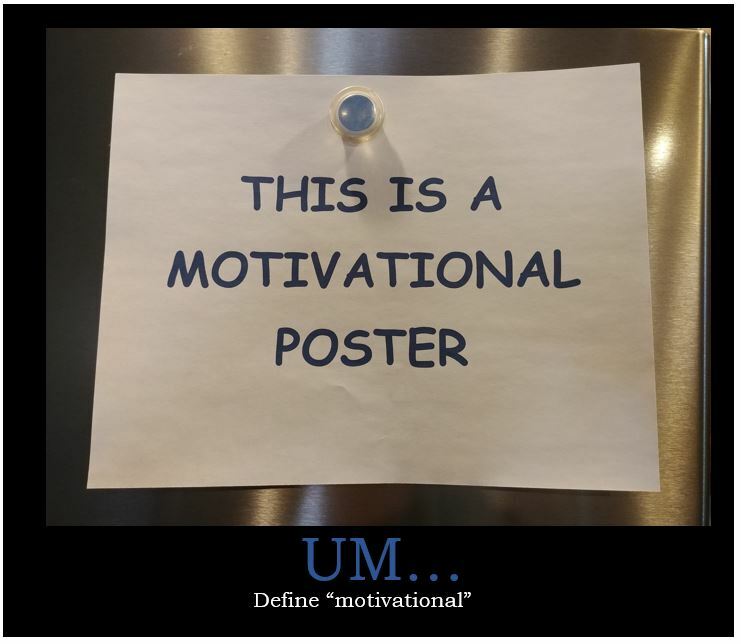 And THAT’S how we do motivational posters around here.